Moppet as we call her is our seal mitted with real character and still a kitten at heart, she loves it when we have a new litter as it means she will soon have new friends to play with! 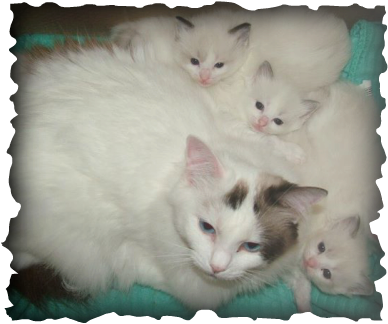 Sophie is our mitted seal point who adores a cuddle at any opportunity. Champagne is our beautiful and loving seal colourpoint, already proving very popular with our visitors and has produced some stunning kittens for us. Farmhouse Davina is our beautifull high white seal bi colour . Born on the 27th March 2009 She is full of character and loves to sit on laps and also laptops when you are trying to work! 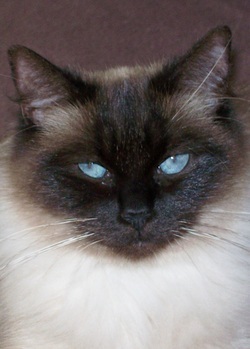 Preziosa Bonnytime is a seal point Bi Colour born 23 July 2009. She is real character and very loving she wants to be with you all the time and has special affections for Malcolm.